Photo: Arthur Orchard – Pirate’s Bay side of Fossil Is from the jetty near the Blowhole. Fossil Island only just qualifies as a true island, jutting out as a narrow rocky, tree covered extension of the mainland from just north of the famous Blowhole. It’s accessible most days by scrambling across the rocky scree that lies between the jetty car-park and the ‘island’ itself. It’s only a couple of hundred metres from the jetty to the boulder strewn point at the other end; where the rocks extend to form a dangerous reef well out beyond the low water mark, posing a hazard to vessels. You will notice all boats heading out of Pirates Bay to the south give the hidden reef a very wide berth. 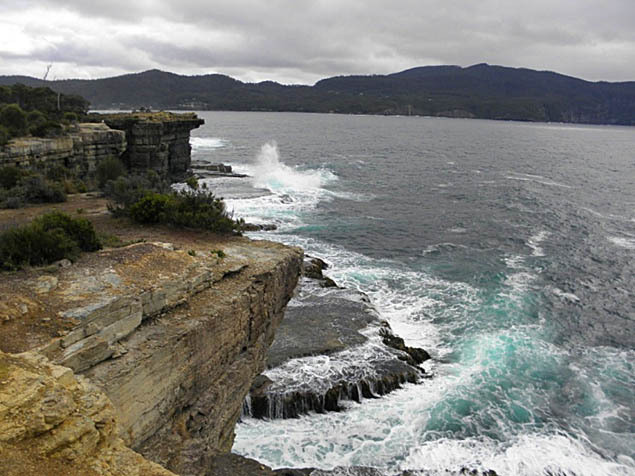 The island is well worth exploring; from here you can see the flotilla of fishing and pleasure boats moored on the sheltered western side -with all of Pirates Bay and beyond as a backdrop – and on the eastern side less than 50 metres away tower the spectacular cliffs facing Fossil Bay. At times huge swells pound in from the Tasman Sea to the southeast, creating an awesome display as the huge waves smash into the rugged coastline. The tracks through the island are all quite safe for walkers, however caution is needed when the seas are in this mood; especially if accompanied by children. Photo: Arthur Orchard – ocean side of Fossil Island on a quiet day.